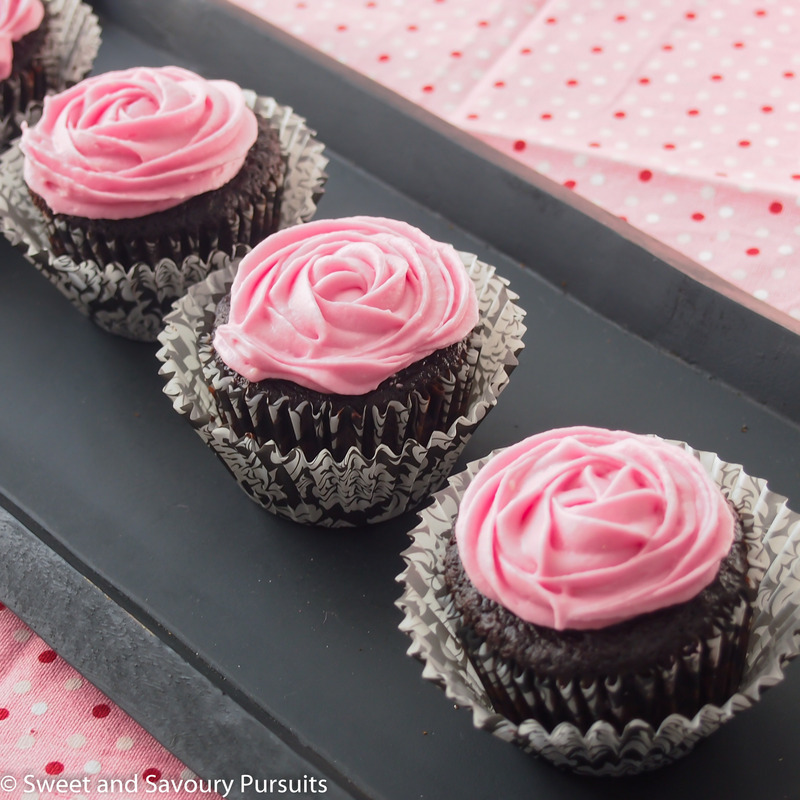 Surprise your loved ones with these decadent Chocolate Beet Cupcakes with Cream Cheese Icing, they’re moist, fluffy and so very chocolatey! Happy Valentine’s Day! This post is very last-minute, but I’m sure you can all agree that sometimes life can get a little crazy. 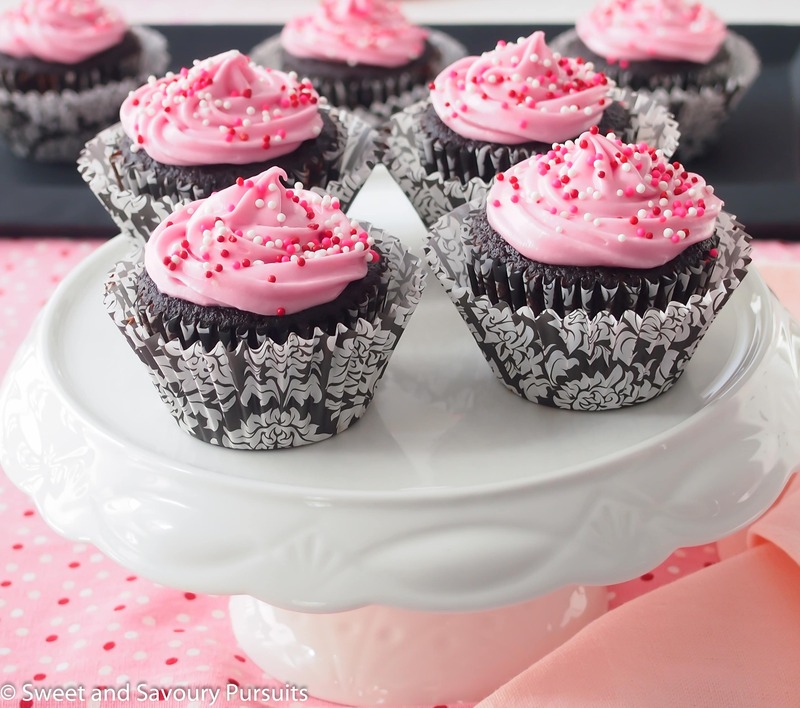 It’s been one of those weeks, but it’s all ok, because these Chocolate Beet Cupcakes with Cream Cheese Icing are simply the best chocolate cupcakes ever. I know it’s a bold statement but I simply can’t help myself, they are that good! Including beets in chocolate cake is not new, I’m sure many of you have heard of it and have maybe even made a dessert combining chocolate and beets before. 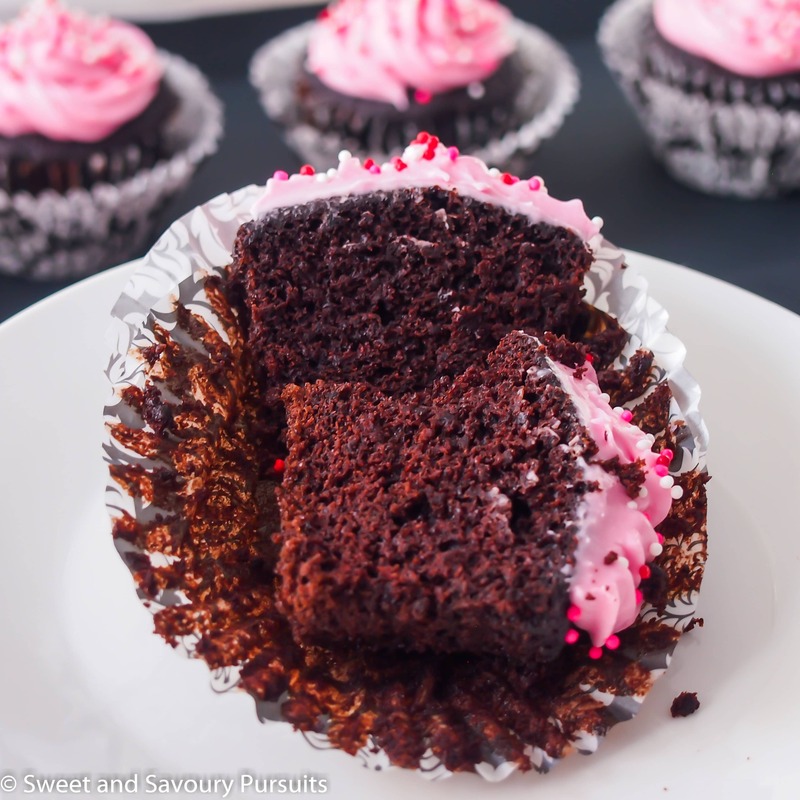 It’s an incredibly delicious combination and although you can’t taste the beets, they definitely make the cupcakes amazingly moist. 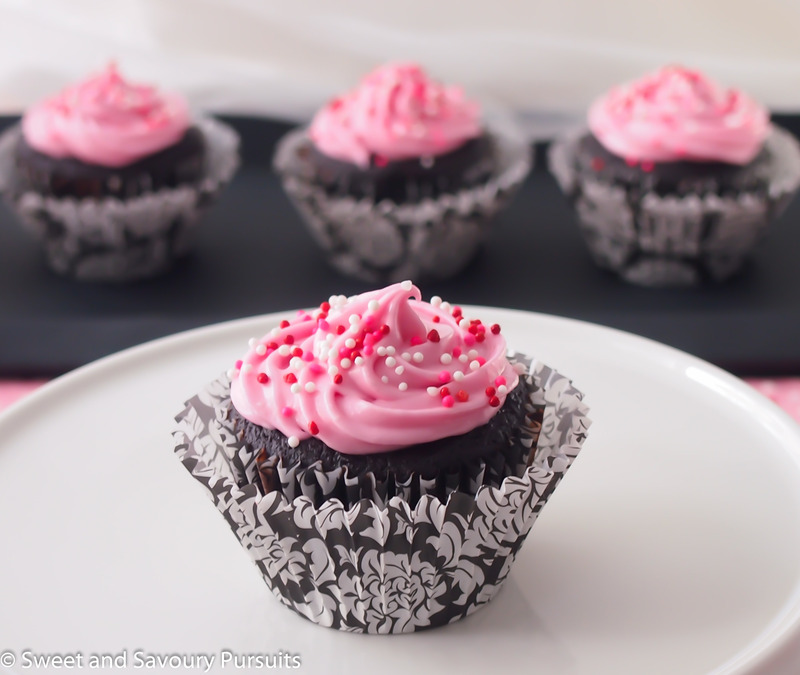 These chocolate beet cupcakes are chocolatey, moist, fluffy and simply decadent with the beet cream cheese icing on them. They will stay moist for days after having baked them, I know since I baked these a few days ago and just got around to making the frosting today. I think they tasted even better today than on the day I baked them! Roasting the beets for these cupcakes reminded me of how delicious beets are, so you may want to roast an extra beet or two for snacking, they’re so delicious and good for you too! I hope you enjoy these chocolate beet cupcakes as much as we did. If you are looking for a decadent chocolate dessert that can be ready in minutes, take a look at this Molten Chocolate Cake recipe, it’s heavenly! Delicious, moist and fluffy chocolate cupcakes made with beet purée and topped with a decadent cream cheese icing. Wash the beets really well. Place the beets in foil paper and add 2 teaspoons of vegetable oil, rub the beets with the oil and then seal the foil so that the beets are well enclosed. Place them on a baking sheet and roast for approximately 45 minutes to an hour depending on the size of the beets, you know they are well cooked when you can easily pierce them with a knife. Remove from the oven, unwrap the beets and let them cool to room temperature before you peel them. Purée the beets in your food processor and measure 3/4 cup of beet purée. Set aside. You will also need to set aside another 3 tablespoons of the purée for the cream cheese frosting. You can make the beet purée ahead of time and refrigerate it for up to 3 days. In a medium bowl, sift together the all-purpose flour, cocoa, baking soda, baking powder and salt. In the bowl of your mixer, beat the butter and sugar until light and fluffy about 3 minutes on medium speed. Add the beet purée and the vanilla extract. Beat well and scrape the bowl at least a couple of times. Add half of the flour mixture while beating on low-speed, then add all of the coffee and water. Add the rest of the flour mixture and beat the batter for a couple of minutes on medium speed. Spoon the batter into the paper-lined muffin cups until 3/4 full. Bake until a toothpick inserted in a cupcake comes out with just a few crumbs clinging to it, about 18 minutes. Let the cupcakes cool in the pan on a rack for 5 minutes. Remove cupcakes onto wire racks and let cool completely. In a small bowl, combine the beet purée with the lemon juice and set aside. Strain the beet purée and lemon juice mixture so that you are left with only the coloured liquid. Strain the liquid a second time and set aside. In the bowl of a stand mixer using the paddle attachment, beat the cream cheese with the butter on medium-high speed until smooth. Beat in the vanilla. Add the reserved beet coloured liquid and beat until well blended. Beat in the icing sugar, one cup at a time until the icing is smooth. Fill a piping bag fitted with a large tip of your choice and pipe the icing onto the tops of the cupcakes. Or you can just spread the icing on the cupcakes. If desired you can add sprinkles to the tops. These are amazingly delicious. Next day is the best day to eat them.. after they have been in the fridge, but then taken out about 30 min before eating.. mmm.. ill keep this as a family recipe tradition! I already have people asking for the recipe. Thank you so much Therese for letting me know how much you enjoyed these cupcakes. I’m so glad to hear that you’ll be keeping this recipe as a family tradition. And I agree, they are better the next day! The colors are so pretty! Since these cupcakes have beets that makes them healthy, right? OMG – these are the cutest cupcakes I have seen in a while! Thanks! You’re right, no one I served them to tasted, felt or saw any pieces of beet in the cupcake! Yes, no need for food colouring, beetroots do a great job naturally and they also make the cake incredibly moist! Thanks! You really should make these, they are the best I have ever had. You can also make this recipe into a layered cake. Thanks! They also taste amazing!